The goal of a solar power system is to efficiently convert energy from the sun into electric power that you can use in your home or business. Over time, the money you save on lower electric bills–or by eliminating your electric bill completely–may pay for the original cost of the solar power system. And unlike fluctuating utility rates, with some financing like PACE, the payments for your solar power system can be fixed over time, which is especially important if you’re on a fixed income or are trying to stabilize cash flow.And then there’s the environmental perspective. Power generated by your clean solar power system is power not generated by polluting, coal-fired utility plants. A solar power system can be a great opportunity for you to contribute to a cleaner environment while saving money at the same time. Solar power financing options can make this form of renewable energy more financially realistic. Solar panels can last up to 40 years, and the system’s inverter should last at least 10 years with replacement warranties available. Solar panel financing programs take this into account by offering longer-term payback periods with manageable payments. With financing options out to 30 years and break even in six to nine years, anyone can see how solar can save a lot of money over the life of the system. Homeowners who want to take advantage of these savings can even find solar energy financing options in some states that provide them positive cash flow over the entire life of their solar system. Now could be the ideal time to take advantage of financing options to go solar. Over the past 20 years, the cost of solar equipment has declined significantly, making solar installations far more affordable. A new way to finance solar, called property assessed clean energy or PACE offers long terms (up to 30 years in some states), fixed-rates and 100 percent financing. PACE makes it easier and more realistic financially since approval is tied to the property, not the owner’s creditworthiness. Purchasing a renewable energy system with solar panel financing may bring about unexpected benefits as well. A recent study by the Lawrence Berkeley National Laboratory found that home values in California increased by four percent or more when equipped with a solar power system. The Federal Investment Tax Credit (ITC) allows purchasers of solar power systems to deduct 30 percent of the cost of the system dollar-for-dollar from their federal taxes. For homeowners with substantial tax liability, this can mean real savings on a solar power system. The benefits of the Federal ITC start to decline at the end of 2019, so it may make financial sense to find a source for solar energy financing sooner rather than later. Consult your tax advisor for details about the Federal ITC. Other state and local incentives related to Solar can be found here. Solar energy financing usually covers materials and installation. What equipment do you install when you buy or lease a solar energy system? Solar photovoltaic (PV) panels that convert solar energy into direct current (DC) electrical energy. Inverters that convert the direct current (DC) that comes out of the PV panels into alternating current (AC) used in our homes and businesses. Balance of system (BOS) components: wires, connectors, DC power optimizers, etc. BOS also includes the racking that holds the PV panels on the roof or in ground-mounts. A fourth component–an energy storage battery and associated energy management software–is becoming more economical and common. 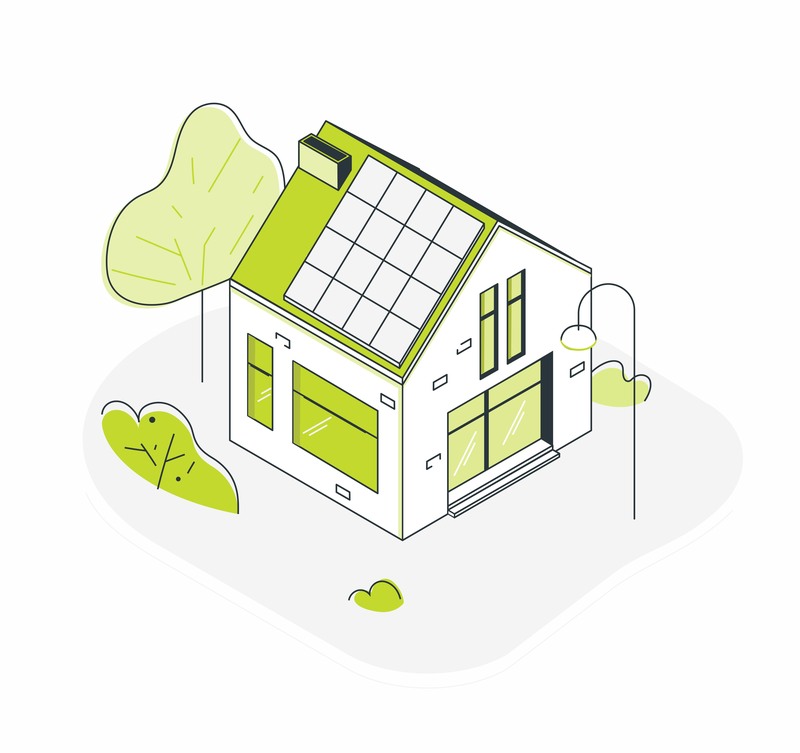 Homeowners can check with their solar energy financing program administrator to see if storage is included in the program. Some buildings are more hospitable to solar power systems than others. To generate power most efficiently, solar PV systems should face south and should not be shaded by trees, buildings or other obstacles. If you’re curious about the idea of property assessed clean energy (PACE) financing for your solar project, contact Ygrene. We can we help you with the solar panel financing process. All Ygrene authorized independent solar contractors are licensed, insured, pre-screened and have been in the solar business for a year or more. Quality installers offer workmanship warranties and are transparent about when and how they use sub-contractors. Solar power is still unfamiliar technology for most homeowners, so don't hesitate to ask your contractor how they plan to achieve a quality solar installation, or any other questions you may have. And if you don't have a solar contractor yet, click on the button below and we can help you find local Ygrene authorized contractors close to your home.